This is one of the large-diameter salami’s I made back on January 26th. Of the three I made, this is the last one I cut open and I’m just thrilled with the results of all three. Packed into a beef bung casing, these were made with Berkshire pork and spiced in three different ways: fennel pollen and white pepper; a five peppercorn blend; and a plain salami as my “control” subject. It was probably 6-8 weeks between opening the first salami and cutting into this last one, but they held up very well. They never got too dry or hard, and really had a perfect texture. I believe I can continue to do better as I gain more experience, but this is the best I’ve made so far. 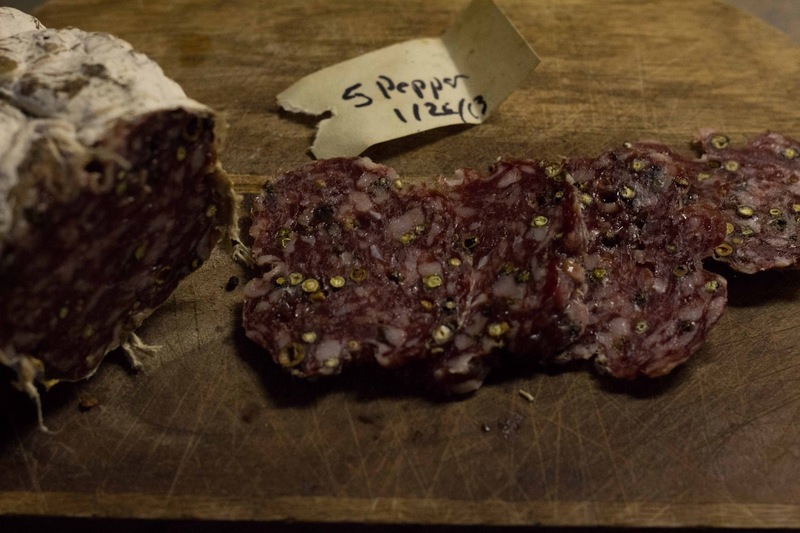 Using a less acidic culture allowed the savory taste of the pork to shine through, without too much of a “bite,” as you might find in summer sausage. 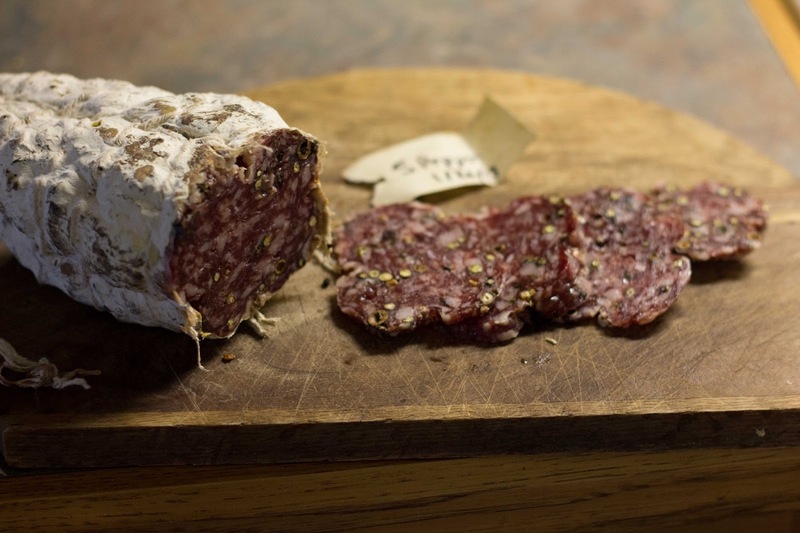 In the coming fall, I think I’ll make more of these large salami, as they age very well and don’t get overly dry or hard, even over several months. This particular salami was spiced with black, white, green, and pink peppercorns. The fifth pepper was “Jamaican pepper,” which is an old name for allspice. I was hoping the peppercorns would keep their individual shades and create a nice mosaic of colors. The individual colors faded during the curing process, however, giving a more muted effect. Still, it’s delicious. Plus, the large size makes these salami’s great to slice up for a family get-together. Once autumn comes around and cools things off (and the pigs fatten back up after a hot summer), I’m excited to try some different combinations. I’d like to try one salami spiced simply with Balinese long pepper, which has a wildly unique and fruity flavor. Another would be a salami flavored with both Szechuan peppers and red chile flakes. I read an article about the reciprocal relationship between Szechuan peppers and red chile flakes in Chinese cooking. There’s a compound called Hydroxy-alpha sanshool in Szechuan peppers, which makes your mouth tingle and feel almost numb. This allows the chile peppers to have a more intense effect on the palate, which is why they’re often paired together. In reality, Carla’s been asking for a truffled salami, and I usually prioritize her requests, so the Szechuan salami might be bumped to later in the year.